And they say Singapore is boring and sterile… Well, you might revaluate this sweeping statement once you have been enmeshed and seduced by this fevered and arousing club. This comes with the caveat, do not arrive totally sober; akin to arriving at a party late when everyone else is in a state of inebriation and you’re not in the groove. Moshi Moshi Bollywood is definitely the sort of club that you arrive at around midnight; after dinner with a few glasses of wine under the belt. And, like many nightspots, the whole ambience is people-driven furthermore, you are somewhat oblivious to the invariably kitsch décor with all the mood-lighting and in this case, the primitive, although amusing Bollywood films projected as a backdrop to the dance floor. You should know all this of course, but for the dweebs, rule number 1: never turn up at a nightclub until later in the part as it just won’t be a ‘happening-thing’. Rule number 2: never go to a nightclub you frequent during the day, it is guaranteed to disappoint, one look at the décor during the stark light of day moreover, the emptiness of people and groove will stain your impression forever. Music is everything in clubs. It’s all about strategic timing and judging the crowd or the mood, which is why we have DJ’s. That’s why there’s such an emphasis on the good ones, even celebrated! Here it’s all about group therapy, the Bollywood dance routines, even if somewhat daggy and reincarnated “Saturday Night Fever” seventies disco, it’s a lot of fun with plenty of impromptu choreography. the world by storm, it’s not all Hindi music here with loads of gyrating-inducing Hip-Hop with plenty of opportunity to make a complete idiot of yourself with impetuous dance moves and abnormal body movements. Besides the lure of the music there are gorgeous, scantily clothed, belly dance costumed persons employed to drag people up on the dance floor to show you all the ‘right moves’; those individuals sitting there in a trance, also perfect for incriminating ones boss, colleagues, friends (all genders, as they have both male and female dancers) with seriously embarrassing pictures taken with the cell phone of compromising and deviate behaviour. Bottom line, this is a place to loosen up a bit and have fun. It is a unique place, as far as I know the only Bollywood club in Singapore, more importantly, frenzied and wonderfully out of control Friday and Saturday nights, open from 7pm to 4am. 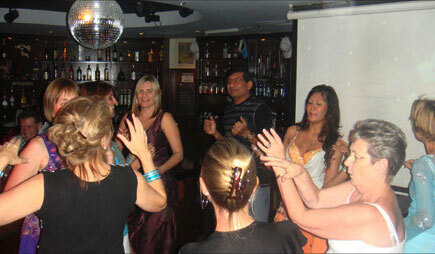 Mid-week its 7pm to 3am with a more regulars ‘clubby’ crowd who are in to their Bollywood dancing.